Oak Creek, Wisconsin. 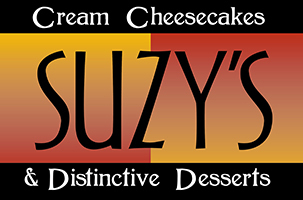 Suzy's Cream Cheesecakes has been offering distinctive cheesecakes and desserts since 1983. Owner Suzy Strothmann grew up in a large family where her mother baked breads and desserts from scratch. So it was natural for her to enjoy baking and creating innovative flavors for her popular cheesecakes. Her business has grown from a small local kitchen and store to nation-wide distribution of her famous desserts. Memories of her mother's scratch baking have bound her to the philosophy of using only the finest, freshest ingredients. Suzy's Cream Cheesecakes stand out among commercially produced cheesecakes because quality always comes first.